What are the economic consequences— positive and negative— of various military activities? What are the trade-offs between military expenditures and other forms of public spending, such as nutrition, health, education, infrastructure, housing? Where is Cuba situated relative to this guns-versus-butter controversy? To a large extent, the lack of attention to the economic implications of the Cuban military comes about because of the lack of adequate information. Reliable time series data on the structure and performance of the Cuban economy are difficult to come by and fraught with methodological questions. 2 Even scarcer are statistics on Cuban military expenditures, size of the armed forces, arms imports, and military foreign aid received or granted. Moreover, little is known about the precise definition of military expenditures used in Cuban statistics and how certain activities are treated. This paper is a first attempt at examining the implications for the Cuban economy of the military, focusing on military expenditures. The first part of the paper looks at conceptual issues related to the definition of military expenditures. The second part reviews sources of military expenditures estimates. The third part focuses on official data and estimates of Cuban military expenditures, identifying some deficiencies in the data. The last part presents several measures of the military burden on the Cuban economy and compares them with similar measures for other nations. The paper closes by raising some issues for further research. The questions of how much of its resources a country devotes to military-related (or security-related) activities, and how the given country compares with others in this same regard, often do not result in unequivocal answers. There are several reasons for this. First, there are differences across countries— and even across organizations specializing on international security matters— with regard to the precise definition of military expenditures. Second, there is a tendency on the part of governments to restrict the amount of information they make public regarding military expenditures, arguing that potential enemies might profit from disclosure of sensitive information. And third, there are serious methodological problems in comparing military expenditures within the same country over time or across countries. Conceptually, military expenditures (ME) can be broadly defined as all the material and human resources devoted by a state to its defense, and intended to: 1) guarantee its national independence, the integrity of its territory and, where appropriate, the respect of the international treaties binding the country to foreign states; and 2) maintain internal security and public order (Herrera 1994, p. 13). The first part of the definition concentrates on the defense of national territory and the ability to meet external challenges, while the second focuses on the maintenance of internal order. These motivations are virtually inseparable and their objective is the same: to ensure the proper functioning of a nation’s society and economy, and basically to guarantee its survival, power and identity (Herrera 1994, p.13). On the other side of the ledger, some expenditures from the budgets of civilian ministries may be primarily for military purposes and therefore augment the budget of Ministries of Defense. Examples include research and development closely associated with weapons, construction of public infrastructures (roads and bridges to and from military bases, housing facilities for members of the military), research in areas such as nuclear power and airspace with military applications. In part to address these national differences, the North Atlantic Treaty Organization (NATO), the International Monetary Fund (IMF), and the United Nations (UN) have developed standardized definitions of ME (see box). These definitions are used by the organizations to compile ME statistics that are widely used. There are several differences among the three definitions, among them with regard to: 1) the treatment of military aid; 2) financing of military pensions; 3) treatment of security forces not permanently engaged in national defense; and 4) research and development activities. All current and capital expenditures on the armed forces, in the running of defense departments and other government agencies engaged in defense projects as well as space projects; the cost of paramilitary forces and police when judged to be trained and equipped for military operations; military R&D, tests and evaluation costs; and costs of retirement pensions of service personnel including pensions of civilian employees. Military aid is included in the expenditure of the donor countries. Excluded are items of civil defense, interest on war debts and veterans’ payments. All expenditure, whether by defense or other departments, for the maintenance of military forces, including the purchase of military supplies and equipment (including the stockpiling of finished items but not the industrial raw materials required for their production), military construction, recruiting, training, equipping, moving, feeding, clothing and housing members of the armed forces, and providing remuneration, medical care, and other services for them. Also included are capital expenditures for the provision of quarters to families of military personnel, outlays on military schools, and research and development serving clearly and foremost the purposes of defense. Military forces also include paramilitary organizations such as gendarmerie, constabulary, security forces, border and customs guards, and other trained, equipped and available for use as military personnel. Also falling under this category are expenditures for purposes of strengthening the public services to meet wartime emergencies, training civil defense personnel, and acquiring materials and equipment for these purposes. Included also are expenditures for foreign military aid and contributions to foreign to international military organizations and alliances. This category excludes expenditures for non-military purposes, though incurred by a ministry or department of defense, and any payments or services provided to war veterans and retired army personnel. The United Nations has drawn up an extremely precise and detailed accounting matrix with three categories of military expenditures: (A) operating costs; (B) procurement and construction; and (C) research and development. Operations and maintenance: a) current-use material; b) maintenance and repairs; c) purchased services; d) rent. Procurement: a) aircraft and engines; b) missiles, including conventional warheads; c) nuclear warheads and bombs; d) ships and boats; e) armored vehicles; f) artillery; g) other ordnance and ground force arms; h) ammunition; i) electronics and communications; j) non-armored vehicles. Construction: a) airbases; b) missile sites; c) naval bases; d) electronics and communications; e) personnel; f) medical; g) training; h) warehouses and depots; i) command, administration; j) fortifications; k) shelters. Perhaps a more significant problem than differences in the definition of ME is that “in the great majority of countries, if not all of them, information concerning questions of national defense are surrounded by an opaqueness symptomatic of the eminently political nature of this subject” (Herrera 1994, p. 23). The secrecy concerning statistical data on military expenditures is justified on the grounds that it reduces information available to other countries, who may be either potential or actual opponents. Another reason for the secrecy is, almost certainly, preventing the general public from knowing too much about their own military expenditures and potentially challenging the level of such expenditures through the political process (Ball 1988, p. 85). It has been alleged that some countries keep two sets of ME accounts: one made public through the national budget and a second— more accurate— used only for internal government consumption. The degree of understatement of ME in the published accounts is not known with precision, but estimates range from 10 percent to “several times” the published figures. A portion of the foreign exchange earned by some countries through exports is often not entered into the national accounts and is instead set aside for special purposes, including the purchase of weapons. Some countries are also known to manipulate foreign trade accounts to disguise purchases of weapons, identifying them as purchases of “capital goods” for the civilian sector. There are at least two critical methodological problems associated with the development of ME statistics that permit meaningful comparisons over time and across countries: 1) estimating military expenditures in real terms; and 2) converting measures of real expenditures in domestic currencies to a common currency base. Deflation: In order to compare real ME over time, it is necessary to deflate current-value statistics to account for changes in prices, i.e., inflation. Ideally, different deflators would be used to adjust components of ME: personnel costs, construction, capital goods, imports of weapons systems, etc. In practice, it is difficult to obtain even a single reliable measure of inflation for most economies, let alone the possibility of a family of deflators for different components of military expenditures. Thus, intertemporal comparisons of resources devoted to ME tend to be affected by the difficulties in properly adjusting for inflation. Conversion factors: The military budget for each country is drawn up in that country’s local currency. To make international comparisons of ME, it is essential to convert the expenditure streams expressed in national currency to a common currency or base monetary unit, usually the U.S. dollar. The choice of the appropriate exchange rate to convert each national currency to U.S. dollars is a methodological problem of considerable proportion. One of the alternatives available is to effect the conversion from domestic currency to U.S. dollars using the official exchange rate between the national currency and the U.S. dollar. However, because official exchange rates tend not to correspond to the ratio between the average price levels of the two countries being compared, this method does not produce meaningful comparisons. Methodologically superior is the use of purchasing power parity (PPP) exchange rates to convert to a common basis. However, PPP exchange rates tend to available only for a limited set of countries and are often not up to date. As a result, analysts of ME generally have to rely on a combination of official and PPP exchange rates. countries over time and also across countries. The best known of these specialized organizations are: 1) the U.S. Arms Control and Disarmament Agency; 2) the Stockholm International Peace Research Institute; and 3) the International Institute for Strategic Studies. U.S. Arms Control and Disarmament Agency Since the mid-1960s, the U.S. Arms Control and Disarmament Agency (USACDA) has been producing an annual compilation of data on military expenditures and arms transfers for a wide range of countries. The most recent issue, World Military Expenditures and Arms Transfers 1993-1994 (USAC-DA 1995), contains ME, arms transfers, armed forces, and macroeconomic data for 166 countries over the 1983-93 decade. ME data in the USACDA publications for the members of the North Atlantic Treaty Organization (NATO) follow the NATO definition and therefore exclude expenditures on internal For other countries (except socialist countries), the data generally refer to expenditures of the Ministry of Defense; where the former data are known to include internal security expenditures, an adjustment has been made to exclude them. For socialist countries — notorious for the paucity of published data and the ambiguity of released information— the USACDA reports ME estimates by the Central Intelligence Agency and other sources. Arms transfers (arms exports and imports) statistics refer to the international transfer (under terms of grants, credits, barter, or cash) of military equipment, usually referred to as “conventional,” including weapons of war, parts thereof, ammunition, support equipment, and other commodities designated for military use. Dual use equipment, which can have application in both military and civilian sectors, is included when its primary mission is identified as military. Statistics reflect the value of goods actually delivered during the reference year, in contrast both to payments and to the value of programs, agreements, contracts, or orders concluded during the period, which are expected to result in future deliveries. For the United States, arms transfers data originate from official statistics, while for other countries they are estimates by U.S. Government sources based on fragmentary information. Armed forces estimates refer to active-duty military personnel, including paramilitary forces if those forces resemble regular units in their organization, equipment, training, or mission; reserve forces are not generally included. Figures for the United States and other NATO countries originate from NATO sources, while all others are estimates by the U.S. Macroeconomic statistics reported by the US-ACDA are the gross national product (GNP), CGE, and value of exports and imports. Where available, the statistics originate from national statistical sources; in other instances, they are estimates made by the U.S. Government and other sources. All value data in the report are expressed in U.S. dollars. Conversion of value data from domestic currencies to U.S. dollars is effected using market exchange rates of the most recent year for which data are available and adjusted for inflation using each country’s implicit deflator. Beginning in 1968 and through 1992, 4 the Stockholm International Peace Research Institute (SIPRI) published estimates of ME and arms trade for a large number of countries in its annual yearbook, World Armaments and Disarmament. The SIPRI yearbooks included annual estimates of the value of ME in domestic currency at current prices and in U.S. dollars at constant prices; the conversion to U.S. dollars was effected using official exchange rates, with the consumer price index as deflator. The most recent SIPRI yearbook containing ME estimates— the yearbook for 1992— contained statistics on 128 countries, of which 96 were developing countries. SIPRI relied on NATO’s definition of ME; SIPRI analysts adjusted national budget statistics to meet the NATO definition. Basically, the adjustments required taking into account the payment of pensions to retired members of the armed forces and the costs of maintaining paramilitary units and of military aid given to friendly foreign countries. The SIPRI yearbooks also contained data on the value of arms transfers; these data were reported in terms of constant dollars for each year. The London-based International Institute for Strategic Studies (IISS) is an independent research center concentrating on problems of security, armed conflict, and arms control throughout the world. The IISS publishes an annual report titled The Military Balance that contains information on the armed forces or arms stocks held by specific countries or regions, arms transfers, military assistance, and the official defense budget. The most recent issue of the report, The Military Balance 1995-1996 (IISS 1995-96), included data on 160 countries. The official defense budget for each country— the proxy for ME used by the IISS— is reported in the yearbooks at constant prices of a recent year in U.S. dollars; the conversion from national currencies to U.S. dollars is generally effected using the official exchange rate. A summary table consolidates data for individual countries on ME, per capita ME, the military burden (defense expenditures as a percentage of gross national product), and the size of the armed forces. It should be noted that unlike the publications of the USACDA and SIPRI, which use the NATO definition of ME, IISS relies on the defense budget of each country and therefore the data reported lack comparability within the same country over time (because of changes in budgeting systems) or across countries. Moreover, the IISS publications generally include ME estimates only for the two most recent years and a reference year in the recent past, all reported in U.S. dollars at constant prices; because the base year for developing the constant-price estimates varies from one issue of the IISS publication to another, it is not possible to put together time series on ME for any country or region from the IISS data. 1) official statistics released by the Cuban government in the context of its annual central government budget exercise; and 2) estimates made by external organizations. This section of the paper describes these official data or estimates and raises some methodological questions and problems pertaining to them. Official information on ME in socialist Cuba is very sparse. For over a decade— from the mid-1960s to the late 1970s— there was a complete blackout on CGE statistics, including ME. Government expenditures data published since the late 1970s is highly aggregated. Moreover, little is known with respect to the definition of ME that is used by the Cuban government in its budget exercises and how certain components (e.g., arms purchases and military aid) are treated. All available official statistics on the Cuban budget are reported in pesos; presumably they are reported in current prices, although this is not explicitly stated. Definition: Cuban budget statistics break down CGE into 8 large categories. One of those categories is “defense and internal order” (defensa y orden interior). The practice of reporting ME at highly aggregated levels— often a single budget line— was common for the Soviet Union and the socialist countries of Eastern Europe (Hutchings 1983; Crane 1987). ME data: In December 1977, Cuba’s National Assembly of People’s Power (Asamblea Nacional del Poder Popular, ANPP) approved a state budget for 1978. 6 This marked the first national budget approved by Cuban government since 1966. In that year, in the throes of an internal ideological debate over the socialist economic model that the country should pursue, the Cuban government abolished the Ministry of Finance (Ministerio de Hacienda)— the institution that traditionally prepared the nation’s budget— and distributed its functions among other agencies. Responsibility for the preparation and implementation of the national budget was handed over to the Central Planning Board (Junta Central de Planificación, JUCEPLAN), but there is no evidence that a national budget was approved for subsequent years. It appears that the nation operated without a budget from 1966 through the late 1970s. With the adoption in the mid-1970s of the Economic Management and Planning System (Sistema de Dirección y Planificación de la Economía, SDPE), Cuba began to reintroduce economic controls, including national and local budgets. As noted above, the first budget approved by the ANPP was for 1978; the ANPP carried out this function regularly through 1990, when the economic crisis precipitated by the dissolution of the socialist community and the breakdown of economic relations with those countries brought about an austerity program known as the “special period in peacetime” (período especial en tiempo de paz). 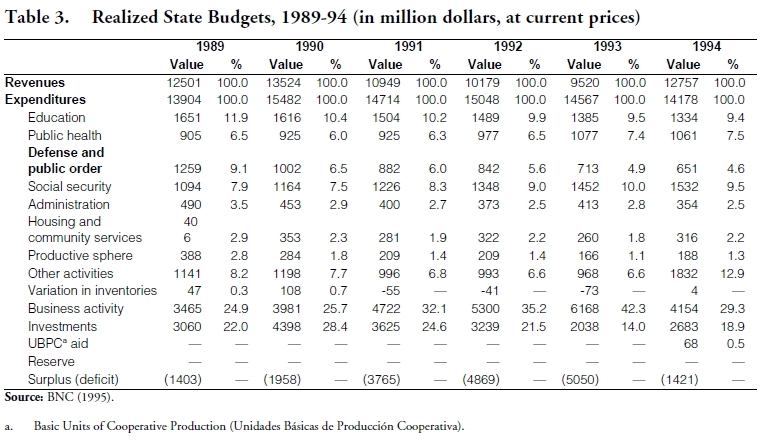 In 1962, budgeted Cuban CGEs were 1854 million pesos, 14 times the 132 million pesos budgeted for 1959; budgeted ME (“defense and internal order” expenditures) in 1962 amounted to 247 million pesos, a 13-fold increase from 1959, or 13.3 percent of CGE. ME declined in absolute terms and as a share of CGE in subsequent years, reaching a level of 213 million pesos and 7.8 percent of CGE in 1966. Prior to the publication of a report by the Cuban National Bank (Banco Nacional de Cuba, BNC) in 1995 (BNC 1995), the Cuban government had not published statistics on ex post, or realized, national budgets. 7 The mentioned BNC report contains statistics on the executed national budget for 1989-94, including for the category “defense and public order”; these data are reproduced in Table 3. While in earlier official publications, the ME category is referred to as “defense and internal order,” the BNC publication uses the title “defense and public order.” It is not clear whether the different titles are the result of translation differences or substantive differences in definition. Comparison of the ex ante and ex post ME figures for 1989 and 1990, the two years for which there is an overlap in data, raises a number of questions. In both instances, ex post or realized ME are significantly lower than the budgeted amounts; for 1989, the difference is about 9 percent (1377 million pesos v. 1259 million pesos), but for 1990 it is a whopping 38 percent (1380 million pesos v. 1002 million pesos). In contrast, realized CGEs in 1989 and 1990 were higher than budgeted CGEs, by 3 percent and 7 percent, respectively. The differences in ME in the two years suggest that they may in fact arise from different definitions of military expenditure. According to the data in Table 3, realized ME (“defense and public order expenditures”) declined steadily during the period 1989-94 both in absolute terms and as a share of CGEs. ME fell by about one-half, from 1259 million pesos in 1989 (9.1 percent of CGE) to 651 million pesos (4.6 percent of CGE) in 1994. Evaluation of official ME statistics: Numerous questions arise about official Cuban ME statistics. Some of the key questions refer to the coverage of the statistics, in particular whether ME statistics include costs such as: 1) training, procurement, and mobilization of reservists; 2) social security payments to former members of the defense establishment; and 3) imports of weapons and military equipment. More broadly, it is unclear how Cuban ME statistics treat dual purpose equipment and capital investments that serve military as well as civilian uses. … something that aroused interest internationally was our expenses for defense and public order: 784 million pesos. … [T]his is very interesting and attracted attention because our country has had to make such efforts and go through so much sacrifice in order to defend itself that many were taken by surprise. And if is estimated that we have a formidable defense apparatus—which we must necessarily have!—this is a good standard to measure the kind of effort our country has made in regard to education and public health. These figures are exact; not a single cent has been changed. Everything is there: what corresponds to such and such sphere, to education, to public health, to defense, to public order. It’s all there for everybody to see. Yes, almost eight percent is devoted to defense and public order, but we are not afraid to say it. The imperialists have forced us to develop powerful forces. We don’t have doubts of any kind. If for our homeland and our Revolution to survive it had been necessary to spend twice as much on defense as on other things, we would have spent twice as much on the defense of our country! We have no doubt about any of these matters. Law No. 24 of 1979 is the main law regarding social security in Cuba, but it is not the only one. Personnel of the Ministry of the Revolutionary Armed Forces and of the Ministry of the Interior are covered by Laws No. 101 and 102. The terms and benefits received by eligible personnel pursuant to the latter laws exceed those available to the general population under Law No. 24 (Donate-Armada 1995). It is not clear whether benefits payed pursuant to Laws No. 101 and 102 are considered as ME or instead are considered in CGE statistics under social security expenditures. The treatment in Cuban CGE statistics of military aid and arms imports is unknown; this is potentially a very important matter, as fragmentary information suggests that the flows into Cuba of foreign military aid and weapons were very significant. Mesa-Lago (1993, p. 149) cites a reference attributed to Minister of the Revolutionary Armed Forces Raúl Castro to the effect that Cuba received 10 billion rubles ($13.4 billion) in free military aid from the Soviet Union over the period 1960-86. Mesa-Lago (1993, p. 149) goes on to cite two Soviet sources, one who suggests that military aid was higher then the 10 billion rubles estimated by Raúl Castro and another who questioned whether all military shipments had been free, implying that some of the weapons shipments might have been financed by loans. Pravda’s columnist omitted mentioning who was responsible for oversaturating Cuba with modern weapons. Soviet military representatives in Havana were doubtful at times of the wisdom of complying with all Cuban requests for more and more weapons. At one point, after the Cubans requested that more Soviet tanks be transported to Cuba to allow for the formation of additional armored battalions, a Soviet adviser told the Minister of the Revolutionary Armed Forces, “Raúl, you shouldn’t ask for that much! The island won’t keep afloat—it will sink into the sea under the load!” That does not exonerate, of course, Soviet leaders and military strategists of their responsibility for stimulating Castro’s appetite for arms for offering them gratuitously, thus making it possible for the regime to build up a large, sophisticated military machine, whose continued maintenance was bound to constitute, particularly in the absence of free military supplies, an unbearable burden for Cuba. Finally, there is no information on how Cuban CGE statistics treat dual purpose equipment and capital investments, such as trucks, ambulances, and road equipment that could be used for civilian or military purposes, and roads, bridges, airports or other forms of infrastructure that could serve both civilian needs and defense purposes. Similarly, there is no information on the valuation methods used for military construction and depreciation rates that used for military equipment and capital investments. Estimates of Cuban ME are available from three external organizations: 1) USACDA; 2) SIPRI; and 3) IISS. Because of the way the estimates are compiled and presented, it is not possible to develop continuous time series from the IISS estimates. The most recent ME estimates from all three sources are described below. USACDA: The latest issue of the USACDA yearbook (USACDA 1995) contains estimates of Cuban ME made by that organization for the time period 1983-93. 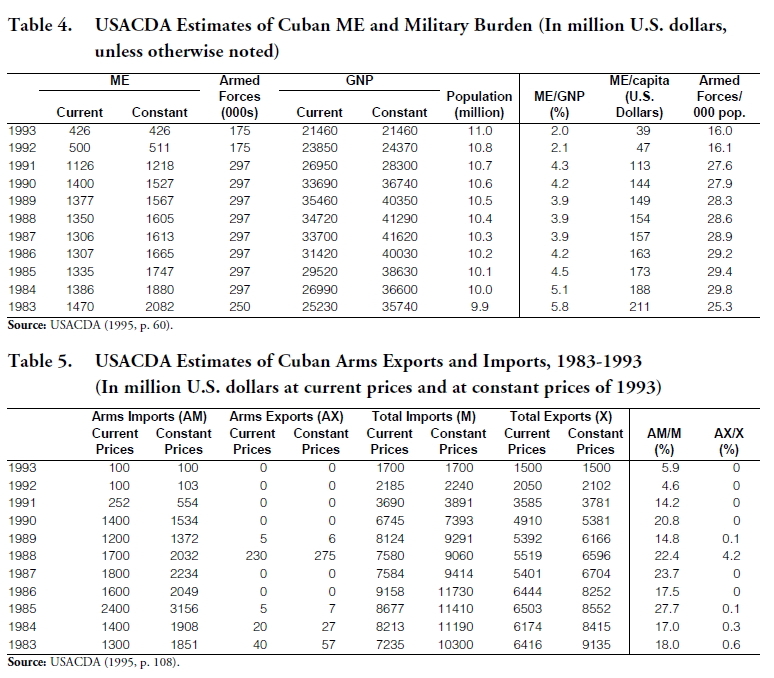 Two time series are presented (see Table 4): 1) annual estimates of Cuban ME in U.S. dollars at current prices; and (2) corresponding annual estimates of Cuban ME in U.S. dollars at constant prices of 1993. The cited USACDA publication is silent on the source of the basic Cuban ME information presented, the exchange rate that was used to make the conversion to U.S. dollars, or the deflator applied. Presumably, the estimates in the USACDA publication use the NATO definition of ME and therefore exclude expenditures related to maintenance of internal order. The USACDA estimates suggest that Cuban ME at current dollars peaked at $1470 million in 1983, fell steadily through the second half of the 1980s, increased again at the end of the 1980s, and plummeted in the early 1990s; ME fell from $1400 million in 1990 to $426 million in 1993, or by nearly 70 percent. The latter decline is even sharper (72 percent) based on estimates in U.S. dollars at constant prices of 1993.
prices of 1993. It is clear from these estimates that arms imports were very significant for Cuba during this period. During the second half of the 1980s, the value of arms imports was roughly one-fifth of the value of overall imports and in 1985 they were the equivalent of 28 percent. For each year in the second half of the 1980s and into the 1990s, USCDA estimates of the value of Cuban arms imports exceeded the level of overall ME estimated by that same organization! 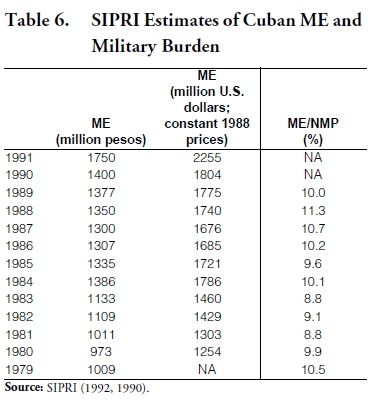 SIPRI: Estimates of Cuban ME in domestic currency and in U.S. dollars at constant prices of 1988 made by SIPRI analysts are reproduced in Table 6. The time series refer to the period 1979-91; as indicated in the text, SIPRI ceased to publish estimates of ME for individual countries after 1991. As the US-ACDA, SIPRI also used the NATO definition of ME, meaning that they did not cover expenditures related to the maintenance of internal order. 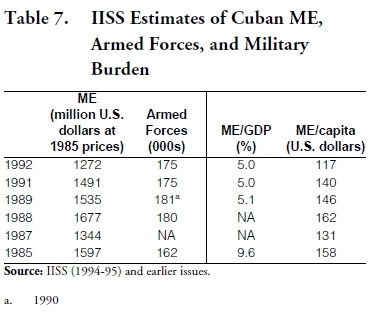 Trends in SIPRI estimates of Cuban ME in Table 6 differ significantly from those obtained from official ME data or USACDA estimates. Thus, according to the SIPRI estimates, Cuban ME (in pesos or in U.S. dollars at constant prices of 1988) rose steadily throughout the 1980s and into the 1990s; the SIPRI estimates do not show the decline in ME in 1990 and 1991 that is observed from the official budget data or the USACDA estimates. IISS: As mentioned above, the emphasis on the publications of the IISS is on the military balance for the most recent biennium. All ME estimates published by the IISS are reported in terms of U.S. dollars at constant prices of some reference year. Because the price basis for the estimates changes frequently, it is not possible to develop time series of any reasonable length. Table 7 contains time series data— with some discontinuities— on estimates of Cuban ME (in U.S. dollars, at constant prices of 1985) for the period 1985-92. For the period under observation, ME peaked in 1988 and declined steadily thereafter. Over the four-year period 1988-92, ME fell by 24 percent. Military expenditures to gross national product ratio (ME/GNP): Perhaps the most widely used military burden measure, the ME/GNP ratio relates military spending to the size of the national economy. It scales the value of ME in a given year to the total value of goods and services produced by the economy over that same interval. Military expenditures to population (ME per capita): The ME per capita ratio relates the level of military expenditures to the size of the nation in terms of population. It complements the ME/GNP ratio, providing information on the relationship between ME and the size of the nation in terms of population rather than wealth. Armed forces to population (armed forces/ pop): This ratio is an indicator of the degree of militarization of the population. It should be noted that the calculation of military burden statistics— which typically compare ME or a related measure of military effort to other variables— introduces additional measurement problems. Typically, there are data availability and methodological problems associated with each of the non-military variables that are used to make the comparisons. This is particularly relevant for the ME/GNP ratio, as the measurement of the value of goods and services produced by an economy is problematic for many developing countries and for centrally planned economies. Tables 8 and 9 present several measures of the Cuban military burden based on official statistics. Table 8 uses ME statistics drawn from the ex-ante official budgets for the period 1978-90 and the net material product (NMP) 8 as an indicator of the size of the national economy. Meanwhile, Table 9 relies on statistics drawn from the ex post official budgets for the period 1989-94 and the gross domestic product (GDP) as the measure for the size of the economy. Strictly speaking, the two military burden time series (for 1978-90 and 1989-94) are not comparable. Nevertheless, some general observations may be drawn from the individual and combined series. The ME/CGE ratios behave in a similar fashion to the ME/NMP or ME/GDP ratios: steady increase during the late 1970s and early 1980s, a peak in 1985— when 13 percent of CGEs were devoted to the military— and a decline in the 1990s. The steeper decline of the ME/CGE ratio compared to ME/GDP ratio during the 1990s is a function of the differences in the behavior of GDP and CGE during this period: while GDP shrunk by 32 percent between 1990 and 1994, budget expenditures remained at fairly high levels because of the need to provide subsidies to enterprises, payments to idled workers, etc., and only began to be controlled in 1993-94. Over the period 1990-94, CGEs fell only by about 8 percent. The ME/capita series also suggests that there was an increase in military effort through the 1970s and early 1980s; ME/capita peaked in 1985, remained at high levels in the second half of the 1980s, and fell significantly during the first half of the 1990s. Selected military burden ratios for Cuba estimated by the USACDA, SIPRI and the IISS are reported in Tables 4, 6 and 7, respectively. Trends in ME/GNP and ME/capita ratios developed by the USACDA (Table 4) track closely those of official data (Tables 7 and 8). One significant difference, however, is that the ratios estimated by USACDA suggest that the peak intensity in Cuban military effort occurred in 1983 rather than in 1985, as suggested by the official data. The armed forces/population ratio developed by USACDA follows the trend in other burden measures but suggests that this ratio peaked in 1984-86. SIPRI estimates of the ME/NMP ratio suggest substantial year-to-year fluctuations in military effort, with a clear trend line difficult to discern. As the series ends with 1989, it does not throw any light on the decline in military effort in the 1990s that is evident from other indicators. IISS estimates of ME/GDP ratios are very sparse, but nevertheless they suggest that the level of military effort declined from the mid-1980s to the early 1990s. Trends in the IISS ME/GDP ratios are similar to those of other military burden ratios. conversion of national military effort and macroeconomic statistics to common definitions and to a common currency. The painstaking work that is required to carry out such comparisons has been carried out by a number of organizations, such as the USACDA, SIPRI, and IISS. It stands to reason that extreme caution should be used in using any of the military burden ratios for serious policy analysis. The most up-to-date and comprehensive set of military burden measures for Cuba is the one that has been developed by the USACDA. Thus, the comparison of Cuban military burden estimates with those of other countries in this section relies on the USAC- DA estimates. terms of level of development, size, and geographic location. documented the fall in military spending and offered reasons underlying this trend. ME/GNP: According to estimates by the USACDA in Table 10, on average all countries of the world devoted 5.7 percent of their GNP to military spending in 1983. Over the next decade, this share fell by over two full percentage points or by over 40 percent. Military spending by developing countries accounted for 6.1 percent of GNP in 1983— higher than the world average. The ME/GNP share for developing countries fell by three percentage points, or by 49 percent over the next decade, a sharper fall than for the world as a whole. The ME/GNP ratios for countries of Latin America and Central America and the Caribbean were substantially lower than the corresponding rates for the world and for the developing countries. This reflects the much heavier intensity of military expenditures in developing countries and in Middle Eastern countries. Starting from lower levels, ME/GNP ratios for Latin America and for Central America and the Caribbean also dropped significantly over the period 1983-83, reflecting the overall reduction in military spending. Cuba’s ME/GNP ratio in 1983 was in line with the corresponding ratios for the world and for developing countries (which were influenced by military spending by NATO and the Warsaw Pact and by Middle Eastern countries). However, Cuba’s ME/ GNP ratio in 1983 was twice the corresponding level for Central America and the Caribbean (which itself is heavily influenced by Cuba’s performance) and nearly three times that for Latin America. Cuba’s ME/GNP ratio declined sharply over the period 1983-93; in 1993, this ratio was significantly lower than for the world and for the developing countries, but still nearly twice as high as the corresponding ratio for Latin America and for Central America and the Caribbean. ME/CGE: In 1983, all countries of the world and the developing countries devoted about one-fifth of their public spending to the military. By comparison, the ME/CGE ratios for Latin America and Central America and the Caribbean were about one-third and one-half, respectively, of those for all countries and for developing countries. The USACDA does not produce estimates of the ME/CGE ratio for Cuba, but based on official data in Tables 8 and 9 it can be estimated that the island’s ratio was higher— but not significantly so— than for other Western Hemisphere countries. Over the 1983-93 decade, the ME/ CGE ratio for all groupings reported in Table 10, as well as for Cuba, fell by about one half. International comparisons of ME/CGE ratios are sensitive to the form of economic organization and the importance of the national budget as an allocator of resources within each economy . For all countries covered in the most recent USACDA yearbook, the ratio of CGE to GNP was around 30 percent (US-ACDA 1995, p. 27); this same average relationship for all countries of the world is mentioned in a study of public expenditures conducted by experts from the International Monetary Fund (Chu 1995, p. 8). The CGE/GNP ratio ranged from a low of 17 percent for East Asian countries— where the role of the public sector in the economy is quite limited— to 43 percent for Western European and 52 percent for Eastern European countries (USACDA 1995, p. 27). The larger the magnitude of CGE relative to GNP, the lower the ME/CGE ratio. 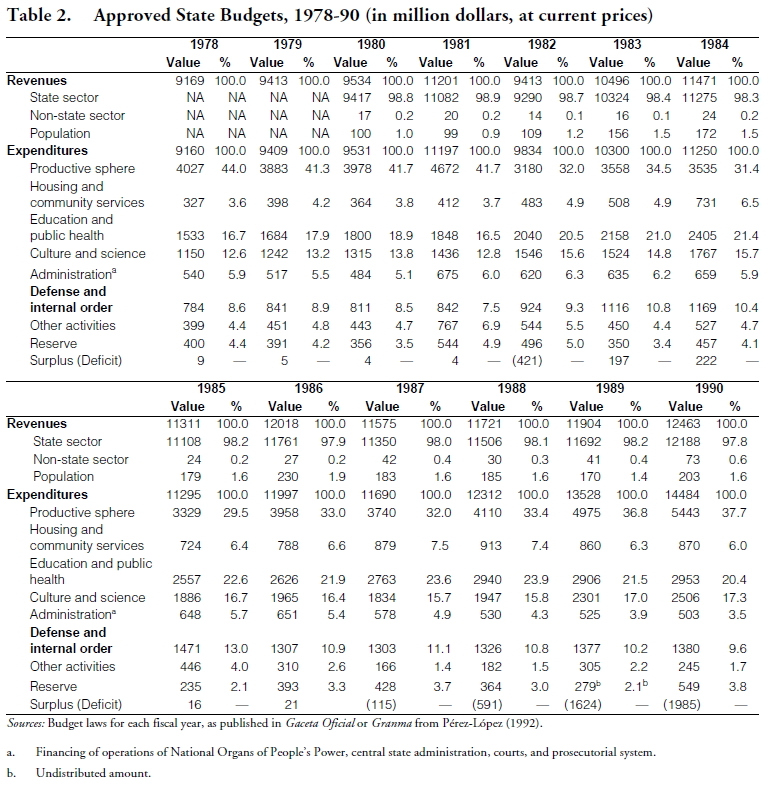 The USACDA does not report CGE/GNP ratios for Cuba; based on the official data in Table 9, it can be estimated that the CGE/GDP ratio for Cuba in 1993 was 114 percent. Thus, it stands to reason that ME/CGE ratios for Cuba will be lower than for other countries where the role of the public in the economy is more limited. $39 in 1993. For Latin America and Central America and the Caribbean, ME/capita fell less precipitously: to about one-half for Latin America as a whole and one quarter for Central America and the Caribbean. Despite the sharp decline, ME/capita in Cuba in 1993 was still substantially higher than in Latin America as a whole and twice as high as the corresponding level for Central America and the Caribbean. Armed forces/000 population: The armed forces/ population ratios fell during the 1983-93 period for all countries considered in Table 9, albeit at a more moderate pace than other military burden measures. For the world as a whole, the reduction was about 25 percent, while it was 20 percent for developing countries, and about 33 percent for Latin American and Central America and Caribbean countries. For Cuba, it fell by about 37 percent. 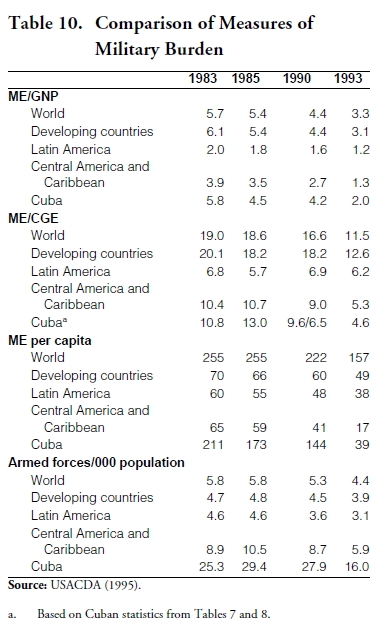 Nevertheless, in 1993, the index of armed forces per 1000 population in Cuba was 16.0, over 4 times higher than the index for the developing countries (3.9) and over 5 times higher than the corresponding index for Latin American countries. The examination of patterns of Cuban ME are hampered by the lack of adequate data. Official ME are scarce and those that are available are subject to numerous questions and uncertainties. The same is the case for estimates of ME made by external organizations. The military burden measures presented in the paper— albeit very crude— suggest that revolutionary Cuba had a high degree of militarization and devoted a considerable share of its national resources to support its military establishment and activities. In the mid-1980s, Cuba devoted around 8 percent of its national income to ME; reductions in ME during the 1990s brought this share down significantly, but nevertheless Cuba devoted more than 5 percent of its national product to ME during the 1990s. 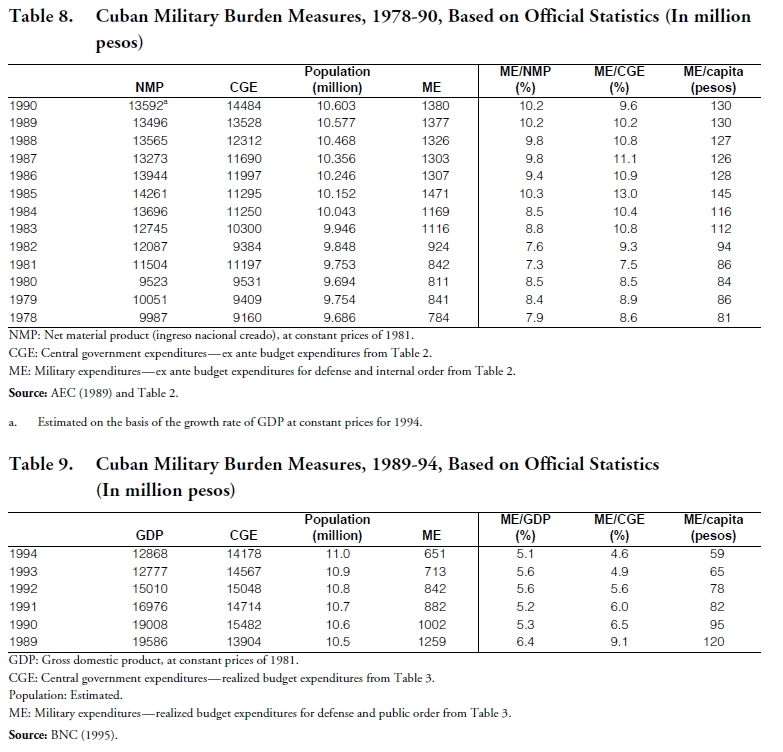 What is the precise definition of military expenditures used in Cuban budget data? How are expenses on military pensions and costs associated with reservists handled? How are procurements of military equipment and capital construction valued and depreciated in budget statistics? How did Cuban international trade statistics treat imports and exports of arms and military equipment? Did Cuba follow the pattern of Eastern European nations of recording military equipment in machinery trade and of the Soviets of treating them in an unspecified commodity residual category (Crane 1987, 21). To what extent was foreign military assistance— mainly from the Soviet Union— already included in official data on ME, or did foreign assistance augment resources devoted to the military? Does it matter for these purposes whether the assistance took the form of grants (gifts) or loans? Alonso, José F. “Cuba’s Armed Forces New Roles: Soldiers, Producers and Consumers,” in The Military and Transition in Cuba. International Research 2000, mimeographed, March 17, 1995. Asamblea Nacional del Poder Popular (ANPP). Liquidación del Presupuesto del Estado 1983. La Habana, n.d.
Ball, Nicole. Security and Economy in the Third World. Princeton: Princeton University Press, 1988. Banco Nacional de Cuba (BNC). Economic Report 1994. La Habana, August 1995. Buchanan, Paul G. “The FAR and Cuban Society,” in The Military and Transition in Cuba. International Research 2000, mimeographed, March 17, 1995a. Buchanan, Paul G. “The Mission and Objectives of the Cuban Revolutionary Armed Forces (FAR) in the Transitional Period,” in The Military and Transition in Cuba. International Research 2000, mimeographed, March 17, 1995b. Castro, Fidel. “Closing Speech at the Second Session of the National Assembly of People’s Power, December 24, 1977.” Granma Weekly Review (1 January 1978) 2-4. Chu, Ke-young, et al. Unproductive Public Expenditures: A Pragmatic Approach to Policy Analysis. IMF Pamphlet No. 48. Washington: International Monetary Fund, 1995. Crane, Keith. Military Spending in Eastern Europe. Santa Monica: RAND Corporation, 1987. “Decreto No. 1709 del Ministerio de Hacienda.” Gaceta Oficial (1 July 1959). del Aguila, Juan. “The Changing Character of Cuba’s Armed Forces,” in Jaime Suchlicki, editor, The Cuban Military Under Castro, pp. 27-59. Coral Gables: Institute of Inter-American Studies, University of Miami, 1989. Domínguez, Jorge I. “The Civic Soldier in Cuba,” in Catherine M. Kelleher, editor, Political-Military Systems: A Comparative Analysis. Beverly Hills: Sage Publications, 1974. Domínguez, Jorge I. “Racial and Ethnic Relations in the Cuban Armed Forces.” Armed Forces and Society 2:2 (February 1976) 273-290. Donate-Armada, Ricardo. “Preliminary Analysis of Retirement Programs for Personnel in the Ministry of the Armed Forces and the Ministry of Interior of the Republic of Cuba,” in Cuba in Transition— Volume 5. Washington: Association for the Study of the Cuban Economy, 1995. “Drop in World Military Spending Yields Large Dividend.” IMF Survey (3 June 1996) 181-183. Fermoselle, Rafael. Cuban Leadership After Castro: Biographies of Cuba’s Top Generals. Coral Gables: Institute of Inter-American Studies, University of Miami, 1987a. Fermoselle, Rafael. The Evolution of the Cuban Military, 1492-1986. Miami: Ediciones Universal, 1987b. Fernández, Damián J. “Historical Background: Achievements, Failures and Prospects,” in Jaime Suchlicki, editor, The Cuban Military Under Castro, pp. 1-26. Coral Gables: Institute of Inter-American Studies, University of Miami, 1989. Goethals, Henry W. “Military Relationship Between Russia and Cuba,” in The Military and Transition in Cuba. International Research 2000, mimeographed, March 17, 1995. Goure, Leon. “Cuban Military Doctrine and Organization,” in Jaime Suchlicki, editor, The Cuban Military Under Castro, pp. 61-97. Coral Gables: Institute of Inter-American Studies, University of Miami, 1989a. Goure, Leon. “Soviet-Cuban Military Relations,” in Jaime Suchlicki, editor, The Cuban Military Under Castro, pp. 165-197. Coral Gables: Institute of Inter-American Studies, University of Miami, 1989b. Herrera, Rémy. Statistics on Military Expenditure in Developing Countries: Concepts, Methodological Problems and Sources. Paris: Organization for Economic Cooperation and Development, 1994. Hewitt, Daniel P. Military Expenditure: International Comparison of Trends. IMF Working Paper WP/ 91/54. Washington: International Monetary Fund, 1991a. Hewitt, Daniel P. “Military Expenditures in the Developing World.” Finance & Development 28:3 (September 1991b) 22-25. Hewitt, Daniel P. Military Expenditures 1972-1990: The Reasons Behind the Post-1985 Fall in World Military Expenditures. IMF Working Paper WP/ 93/18. Washington: International Monetary Fund, 1993. Hutchings, Raymond. The Soviet Budget. Albany: State University of New York Press, 1983.
International Institute for Strategic Studies (IISS 1995-1996). The World Military Balance 1995-London: Oxford University Press, 1995.
International Institute for Strategic Studies (IISS 1994-1995). The World Military Balance 1994-London: Oxford University Press, 1994. León, Humberto. “Impact of the Economic Crisis on the Cuban Revolutionary Armed Forces (FAR),” in The Military and Transition in Cuba. International Research 2000, mimeographed, March 17, 1995. “Ley No. 29— Ley Orgánica del Sistema Presupuestario del Estado.” Gaceta Oficial (12 December 1980). Mesa-Lago, Carmelo. “Availability and Reliability of Statistics in Socialist Cuba.” Latin American Research Review 4:1 (Winter 1969a) 59-91 and 4:2 (Summer 1969b) 47-81. Mesa-Lago, Carmelo. “The Economic Effects on Cuba of the Downfall of Socialism in the USSR and Eastern Europe,” in Carmelo Mesa-Lago, editor, Cuba After the Cold War, pp. 133-196. Pittsburgh: University of Pittsburgh Press, 1993. Mesa-Lago, Carmelo, and Jorge Pérez-López. A Study of Cuba’s Material Product System, Its Conversion to the System of National Accounts, and Estimation of Gross Domestic Product per Capita and Growth Rates. Washington: The World Bank, 1985. The Military and Transition in Cuba. International Research 2000, mimeographed, March 17, 1995. Millett, Richard L. Cuba’s Armed Forces: From Triumph to Survival. Cuba Briefing Paper Series No. 4. Washington: Center for Latin American Studies, Georgetown University, 1993. Neuman, Stephanie G. “Arms Transfers, Military Assistance, and Defense Industries: Socioeconomic Burden or Opportunity?” The Annals of the American Academy of Political and Social Science 535 (September 1994) 91-109. Pavlov, Yuri. The Soviet-Cuban Alliance 1959-1991. New Brunswick: Transaction Publishers, 1994. Pérez-López, Jorge F. The Cuban State Budget: Concepts and Measurement. Coral Gables: North-South Center, University of Miami, 1992. Roca, Sergio. “Economic Aspects of Cuban Involvement in Africa.” Cuban Studies 10:2 (July 1980) 55-80. “Resolución No. 156/1981 del Comité Estatal de Finanzas— Norma Complementaria No. 2 de la Ley Orgánica del Sistema Presupuestario del Estado.” Gaceta Oficial (1 October 1981). Suárez, Andrés. “Civil-Military Relations in Cuba,” in Jaime Suchlicki, editor, The Cuban Military Under Castro, pp. 129-164. Coral Gables: Institute of Inter-American Studies, University of Miami, 1989. Suchlicki, Jaime, editor. The Cuban Military Under Castro. Coral Gables: Institute of InterAmerican Studies, University of Miami, 1989. U.S. Arms Control and Disarmament Agency (US- ACDA). World Military Expenditures and Arms Transfers 1993-1994. Washington: USACDA, 1995. Walker, Phyllis Greene. “The Cuban Military Service System: Organization, Obligations and Pressures,” in Jaime Suchlicki, editor, The Cuban Military Under Castro, pp. 99-128. Coral Gables: Institute of Inter-American Studies, University of Miami, 1989. Walker, Phyllis Greene. “The Missions and Doctrine of the Cuban Revolutionary Armed Forces,” in The Military and Transition in Cuba. International Research 2000, mimeographed, March 17, 1995a. Walker, Phyllis Greene. “The Personnel, Organization, and Capabilities of the Fuerzas Armadas Revolucionarias,” in The Military and Transition in Cuba. International Research 2000, mimeographed, March 17, 1995b. Walker, Phyllis Greene. “Cuba’s Revolutionary Armed Forces: Adapting in the New Environment.” Cuban Studies, volume 26, forthcoming, 1996. Zubatkin, Mickail. “Revolutionary Armed Forces of Cuba: Role and Position, Today and Tomorrow” in The Military and Transition in Cuba. International Research 2000, mimeographed, March 17, 1995b.